THIS LISTING IS FOR ONE STUD! Please pick the finish and side from a drop-down menu. This is nose piercing of Sterling Silver and made with 3mm shiny finish dot. It is perfect on a daily basis and for special occasions. This jewelry is made in my studio, and it is completely handmade work, or it could be a great gift. 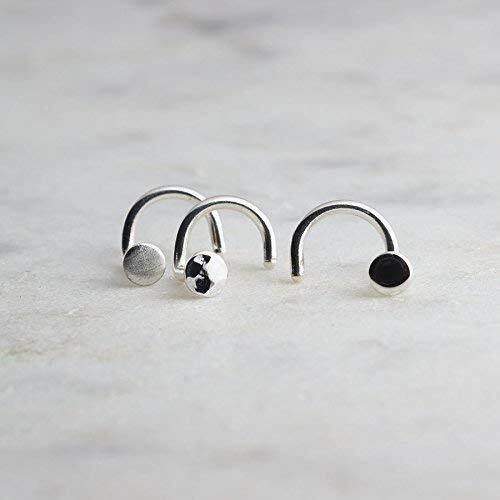 SIZE - 6mm, Wire gauge: 18mm - 0.8mm (Standart - 20gauge) Disc: 3mm Finish: Shiny Metal: Sterling Silver.925 Standard size that works for most nose piercings: 20 gauge. Please leave a note at check out about the SIDE: Left or Right and finish: Shiny, Matte, or Hammered.